Ruby-throated Hummingbird on Monarda in Backyard. Sumi Brush Pen and Watercolor by Ken Januski. I always feel a bit guilty showing work of mine that is largely based on photos. That's because I'm so critical of art based on photos. 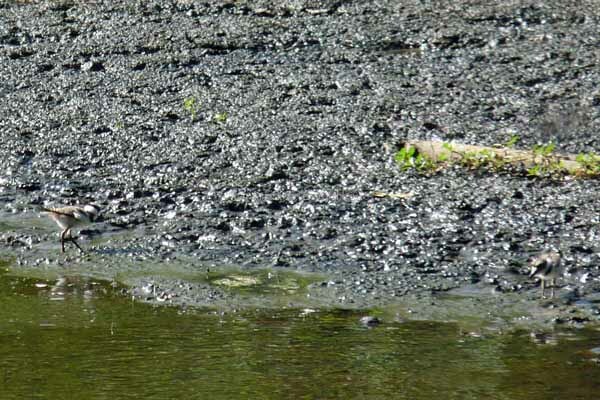 That was the case with the Killdeer in my last post. The more I've painted though, especially since I turned from abstraction to naturalism the more I realize that photos aren't anathema. They're just very dangerous. But I think it would be safe to say that the vast majority of people who look at my work, or most art, are very partial to work that looks like a photo. And that's why I'm so adamantly against it. The general populace now gauges reality through photos, even though they are very limited and show only one aspect of objects portrayed. Still I use them occasionally because they help me to remember all the details that I often can't seem to force into my memory. In that sense they are a useful aid to memory(aide memoire). More often though I'd like to portray the experience of something. If you've ever seen a Ruby-throated Hummingbird you probably realize that they rarely sit still. They are always moving, well almost always. And the movement is more emblematic of them than those rare times when they perch. So the 12x16 watercolor above is done strictly from memory. I've looked at the Ruby-throated Hummingbirds in our yard a lot over the last few summers. That doesn't mean that I also haven't missed a lot. But I wanted to do something spontaneous that was based on my memory of them and of the Monarda on which they often feed. The painting above is meant to render just one hummingbird, not a number of them. And within a few seconds just one hummingbird will have been in that many different positions. So which is more 'real', the painting above, or one that captures every iridescent feather in a sitting bird that looks like it's been stuffed? As I started to write this brief post I was going to stick to the dichotomy between rendering an experience and rendering a photo. But I realized that there is also a third alternative and that is the picture postcard. It is more like a picturesque rendering of a scene, relying more on sentimental formula than anything else. I don't see that much of this sort of art, but I'm sure that's only because I try to steer clear of places that concentrate on cute art. 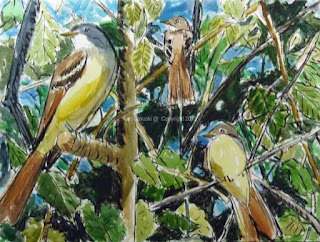 Still it is one of the other ways in which artists try to portray what they see, especially in terms of birds and wildlife. 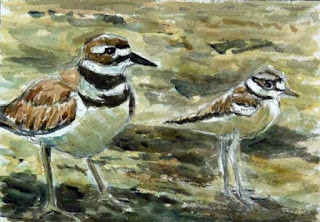 Killdeer and Chick. Watercolor Painting by Ken Januski. 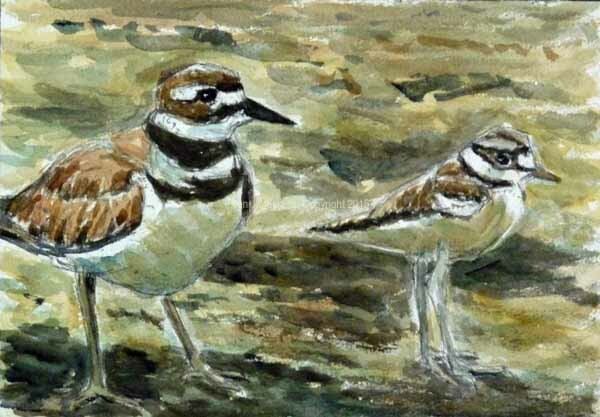 I'm still hoping to do another large watercolor and sumi brush pen painting over the next few days but there was something that kept nagging me about the young Killdeer that I saw along the Manayunk Canal. last week. So finally I broke down and did this small 7x10 watercolor of one adult and one of the young. It is very closely based on some photos that I took. As I was doing this I was also listening to some music by Igor Stravinsky and reading about him. Though I'm not an expert, not even a pseudo-expert, nor even an aficianado of classical music I think it's safe to say that he was the most revolutionary 'classical' composer of the 20th century and the most influential. Everything I hear by him sounds fresh. 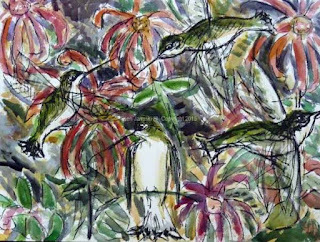 When I think about most wildlife art, or for that matter art period, it often seems of another era, perhaps reminiscent of baroque music, perhaps romantic 19th century music, or in the case of fine art, stuck in an endless loop around Marcel Duchamp's 'Urinal' of about 100 years ago. There is not much that seems as fresh as Stravinsky. I don't know the answer to this, nor do I know if it needs an answer. I still love music by Handel and Bach, to name just a few older composers. It is thrilling to listen to today even if it doesn't seem timely. The same is true of the art of Piero della Francesca, Rembrandt, Velasquez to name just a few older artists. It's hard to criticize contemporary art that emulates people like that. I only mention this because I think the watercolor above is more an homage to much older work than anything else. Much of my other work tries to achieve the freshness of Stravinsky, though I think it rarely does. Still it is a worthy goal. Adult and Two Juvenile Great-crested Flycatchesrs. Watercolor and Sumi Brush Pen Painting by Ken Januski. I think I mentioned recently that I've been hoping to do some more developed work for an international competition whose deadline is fast approaching. After all those sumi brush pen sketches I finally bit the bullet and started work on the 16x20 inch watercolor and sumi brush pen painting above. I've wanted to make a painting of a scene similar to this for the last 18 months or so ever since I saw one or two adult and two juvenile Great-crested Flycatchers all together at Morris Arboretum last spring. This is based on various photos from that day. We've seen another 3-4 Great-crested at the same location over the last few weeks so maybe that is what spurred me on to this subject. I still have a bit of time before the competition so there may still be one more painting using this medium in the near future. In the past I've entered this competition twice and had my linocuts accepted twice. But I lost money on all the various costs involved. Even if I'd sold I would have lost money because prints are almost by definition less expensive than paintings. So this year I've decided to enter some paintings and perhaps a couple of woodcuts. We shall see. 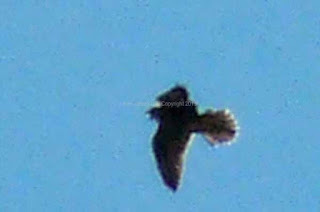 Peregrine Falcon Flying Over Backyard. Photo by Ken Januski. It was after a 12 hour day exhibiting at the Manayunk Arts Festival in 2012 that I hiked up hill to our house. As soon as I got a block away from Main St. and the festival I heard a shrill cry. When I looked up I saw at least one and maybe more raptors. Almost immediately I realized that they must be part of the peregrine family from the nearby church steeple. That was in fact the case and just a half block away were birders keeping track of the adults and the newly fledged young. Later that summer we often heard the same shrill cries overhead in our backyard and saw up to three peregrines at the same time flying high overhead. We heard and saw them again in the summer of 2013 then not at all in 2014, though they had again bred at the church. They bred again this year, though I never saw them in my few trips to the church. But just this week Jerene heard their cries again. She heard and saw them briefly on Tuesday and Wednesday. So yesterday I sat out in the back with camera binoculars hoping to do the same. No luck. Then at the same time today we heard then saw two of them. I was ready with binoculars and camera but almost immediately they flew into the sun and were gone. I was only able to get the one grainy photo above, most likely a juvenile. It's amazing to me to know that they breed near here. It's almost more amazing to see some, and I assume that they're the same ones, flying over our backyard!! 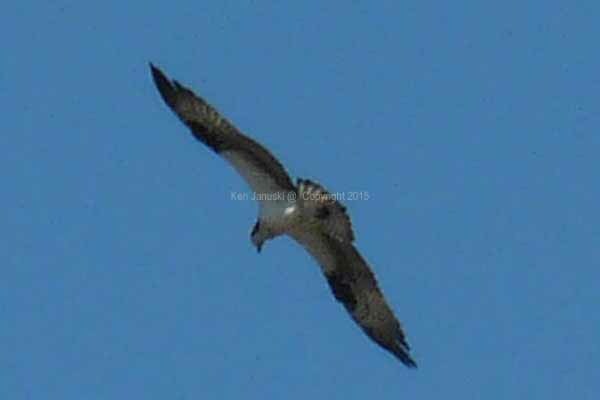 Osprey Flying Over Manayunk Canal. Photo by Ken Januski. Not quite as surprising but just as welcome a sight was this Osprey seen about a half mile downhill along the Manayunk Canal yesterday. 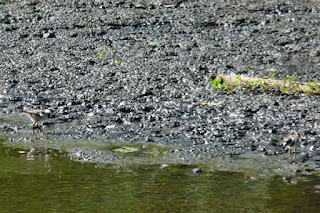 Two Juvenile Killdeer at Manayunk Canal. Photo by Ken Januski. 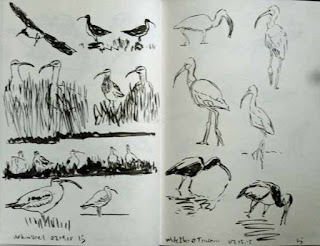 This time of year can also bring shorebirds and sometimes Night Herons to the canal so I've been looking recently. I've often suspected that Killdeer breed there. Yesterday that was confirmed when I saw these two very young Killdeer with one of their parents at the canal. They always look like a ping pong ball on stilts. I did a couple of not quite successful sumi field sketches which I'm not going to show here. But I wouldn't be surprised if they eventually appear in a print or painting. July is often considered a dull time for birding. But that certainly has not been my experience. 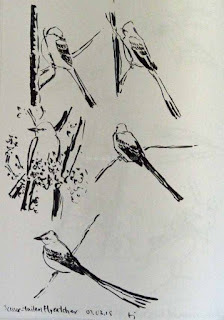 Willow Flycatchers. Sumi Brush Pen Sketches by Ken Januski. As I was completing the two pages above in a Stillman and Birn Epsilon sketchbook yesterday I was thinking about how much I've been enjoying drawing recently, especially with the sumi brush pen. Then on the radio I heard a version of Bob Dylan's 'May You Stay Forever Young,' a song I've always very much liked. 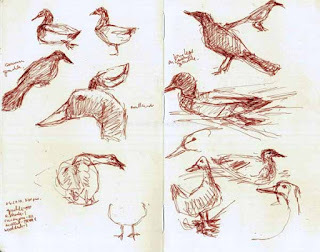 It seemed to parallel my feelings about sketching: may I and anyone else who likes to draw continue to do so. It is hugely rewarding. 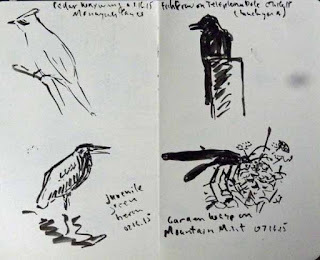 Cedar Waxwing, Fish Crow, et al. Sumi Brush Pen Field Sketch by Ken Januski. I mentioned on another post that many of these sumi sketches have been based on my own photos. I started somewhere near the beginning of my boxes of them, all alphabetically sorted. As you can see with the Willow Flycatchers above I'm reaching the end. There are no local birds whose names start with 'Z'. That just leaves 'Y', with all those Yellow Something-or-Other birds. 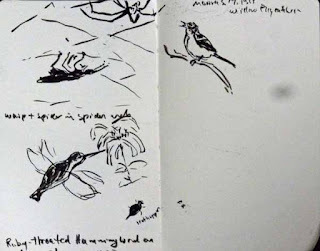 I've also tried to continue using the sumi brush pen when I'm out birding. It creates a line that is a little too large for the size of the sketchbook that I carry in my back pocket. But I'm getting better at being able to use finesse and sensitivity of touch to be able to work this small. 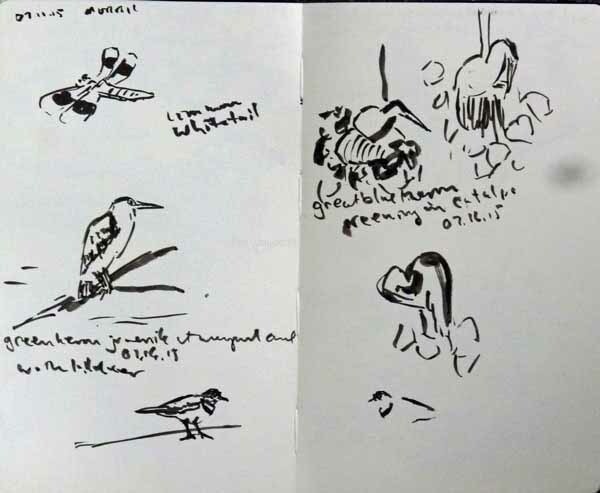 Above a Cedar Waxwing and young Green Heron, both seen along the nearby Manayunk Canal, and a Fish Crow on telephone pole and as yet unidentified wasp on the flowers of our Mountain Mint, both seen while I sat in a chair in our backyard. Grass Spider and Wasp, Ruby-throated Hummingbird, et al. Sumi Brush Pen Field Sketch by Ken Januski. I spent about 10-15 minutes watching the scene above in our backyard, just a foot away from where I sat, through my Pentax Papilio Extreme Close-Focus Binoculars. 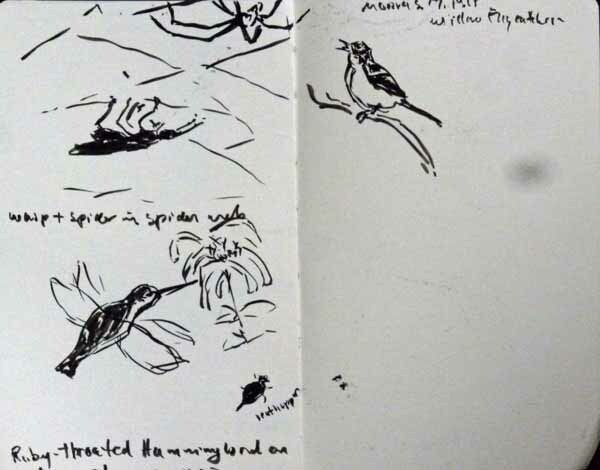 (I'm not trying to name drop in this post but when a product works well, like Stillman and Birn sketchbooks, the Kuretake Sumi Brush Pen and the Pentax extreme close focus binoculars I'm happy to mention them in case others might want to use them. 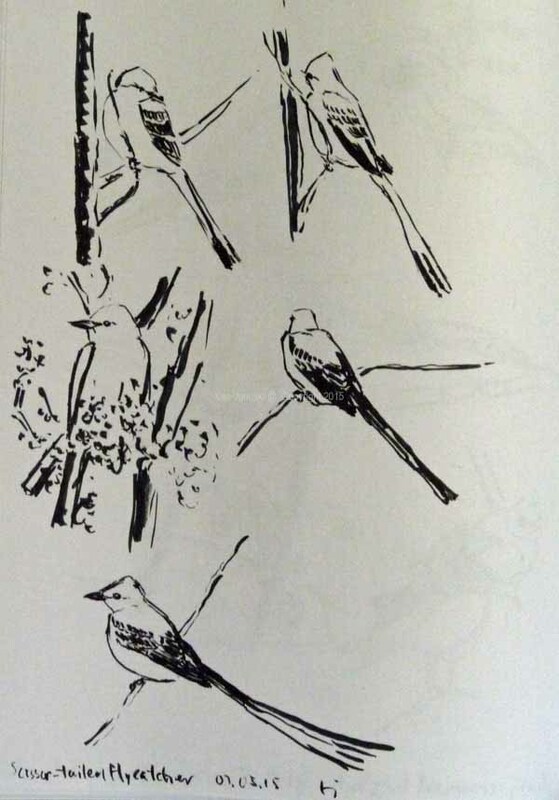 In fact I only know about the binoculars due to a talk by an accomplished local birder on Birding Beyond Birds, e.g. dragonflies, butterflies, etc. where he mentioned how good they were). For the first time ever we've noticed a not of three-dimensional spider webs in our yard. They can be as deep as they are broad. As I watched the small wasp and the spider in the web I really couldn't figure out what was going on. Both were upside down. Was the wasp trapped and desperately trying to get out? If so why did he sometimes seem to approach the spider rather than vice versa? Was the web sticky, like most are? If so why did he seem to move so freely. As I watched it through the binoculars, mainly so I could see the spider better, I decided I might as well try to get it down on paper. That is the scene in upper left. Later when I went inside I investigated and found that the spider is most likely a 'Grass Spider', one of many funnel spiders, whose webs are not sticky. This spider is also timid and will often run from whatever is in its web. Well that pretty well explains what I saw here. It is amazing how much there is to see in nature if you take the time to look. 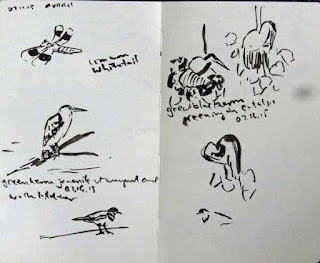 Also on the page one of the visiting Ruby-throated Hummingbirds, feeding on the Monarda in the yard, and a Willow Flycatcher at Morris Arboretum, the same bird portrayed from photos at the top. 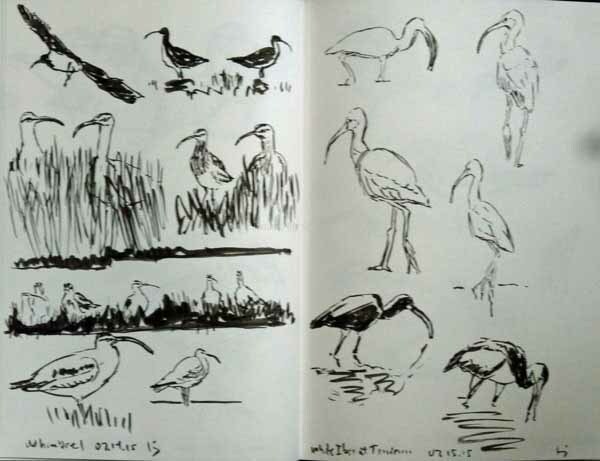 Whimbrel and White Ibis. Sumi Brush Pen Sketch by Ken Januski. There is a big juried show coming up that I'm preparing to submit work for. No it is not Birds in Art. In any case as I continue to do sumi brush pen drawings from my photos I'm always thinking about which ones could be used for something more developed. Above are two pages of Whimbrel, seen in Cape May, NJ over the last few years, and an immature White Ibis seen at Heinz NWR in Philadelphia a number of years ago. I never know until I do the drawings which resulting drawing might convince me that it is the one to develop more. Time will tell. There are only a couple of weeks before submissions are due to I'll need to decide soon. Common Whitetail., Killdeer, Great Blue Heron in Tree, et al. Sumi Brush Pen Field Sketch by Ken Januski. 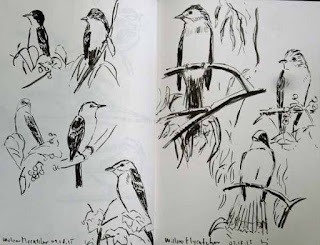 And finally a couple more small sketchbook pages of sumi brush pen sketches from life. Except for the Common Whitetail at top left, all of the images are from the Manayunk Canal a few days ago: another immature Green Heron, with nearby Killdeer, and three versions of a Great Blue Heron curled in various intriguing shapes up in a tree. I realize that in switching from pen or pencil to sumi brush pen in my field sketches I'm losing a lot of detail. But I think I'm gaining life and/or animation as well as a greater concentration on the entire scene, all of which are helpful in doing a more developed painting or print. It's well worth it to me. And it probably has something to do with why I have a renewed excitement about the possibilities of drawing. 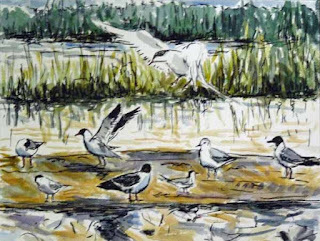 Forster's Terns, Laughing and Bonaparte's Gulls at "The Meadows.' Watercolor and Sumi Brush Pen by Ken Januski. At least once a year, sometimes more, I try a more energetic, spontaneous type of watercolor. Though I'm excited with them as I start by the end of the day or maybe a day or two later I've become disappointed again. They haven't lived up to my expectations. This year though I'm still happy with the Red Knots and other birds from Cooks Beach, NJ that I showed a week or two ago. Something seemed to work well in that combination of sumi brush pen and watercolor. Perhaps the larger size, at least for me, of 12x16 inches helped. In any case after weeks of sumi brush pen studies I wanted to get back to a larger work. This is it above. I have long wanted to do something with a photo I took at 'The Meadows' in Cape May, NJ about three years ago. The combination of Laughing Gull with wings up in the air, smaller Bonaparte's Gull and even smaller Forster's Terns was appealing. I just couldn't figure out how to do it without it looking like a blatant copy of a photo. Finally I decided that adding some other birds, including the Forster's Tern coming in for a landing might give it a bit more energy and depth and help prevent it from looking like a staged scene. I'm largely happy with it. 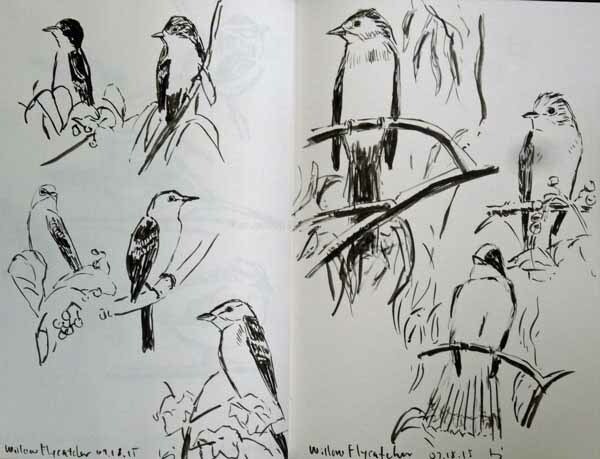 The potential problem with this type of more spontaneous work is that in working quickly, you'll make a mistake, either in a bird itself or in the proportion or scale of birds in relation to one another. This type of thing can be worked out in studies for more finished work but it seems antithetical to the type of spontaneous work I'm trying to achieve here. As I said I generally only do one or two more energetic watercolors like this each year. I'm generally so disappointed in the first one that I don't return to it. But that's not the case with these last two sumi and watercolor paintings. So this time I expect to do a few more and see if I can't come up with a semi-permanent way of working in watercolor. Scissor-tailed Flycatcher. Sumi Brush Pen Sketch by Ken Januski. There is a fairly convoluted source of the title of this post. I have been listening to Robert Greenberg's course for The Teaching Company on composer Igor Stravinsky. As he was talking about how Stravinsky studied composition with the composer Rimsky-Korsakov he quoted Stephen Walsh, from his book Stravinsky: A Creative Spring: Russia and France, 1882-1934, on Rimsky-Korsakov's working methods. He was old school and regimented and believed that "inspiration was the reward of persistence." 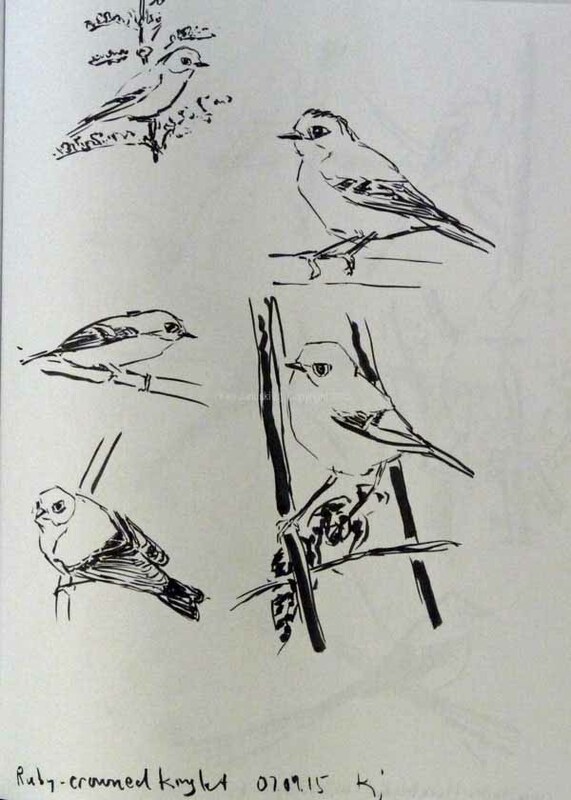 The reason that I even noticed this I think is that I'm now on about the 50th sheet of sketches from my own photos of birds using the Kuretake Sumi Brush Pen. Why in the world am I doing this? It almost seems like penance, though there is no denying the pleasure in using the brush pen. But for all the pleasure there's a lot of pain. Almost every page has at least one mistake on it, where I wish that I'd made a different mark rather than the one I did. Some pages are all mistakes. My thought has been that I am learning something. By having to decide on just one unerasable line for the top of the head, or the chin, or the curve of the breast I'm making decisions and learning something. I think that the bulk of what anyone learns come from making decisions. They may be right or wrong but you don't really learn much until you invest in a decision. There's also a bit of hope in this. I'm hoping that it will pay off, especially as I get to page 50 and it doesn't look significantly better than page 1. But still I think that at some point it will pay off, that at some point I'll spontaneously put to work all that I've learned and that the work will look spontaneous, not labored. So I hope you can see where this quote regarding Rimsky-Korsakov was so striking to me. And it does ring true. Sometimes for me my most inspired, or at any rate the least labored work, will come after a long time doing studies of some sort. 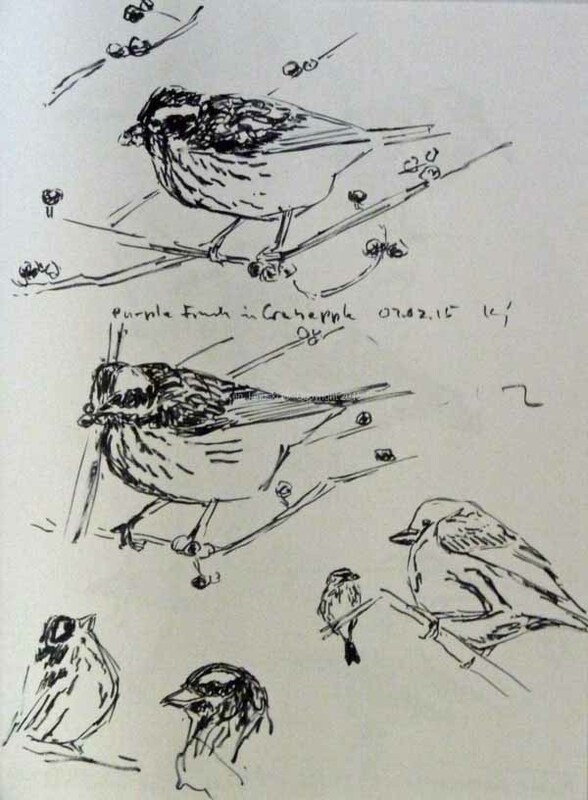 Below are two more pages from the recent spate of sketches with the sumi brush pen. Purple Finch. Sumi Brush Pen Sketch by Ken Januski. Ruby-crowned Kinglet. Sumi Brush Pen Sketch by Ken Januski. I'm most likely going to kill off one of my web sites soon and replace it with pages right here. You can see some of the replacement pages in the links on the upper right under Gallery. It was easy to choose some woodcuts and linocuts to use as examples of my work. 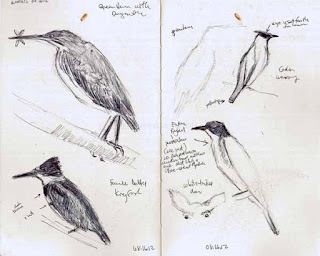 But due to moving from one computer to another over the last few years I've lost track of many of the photos of my own field sketches. 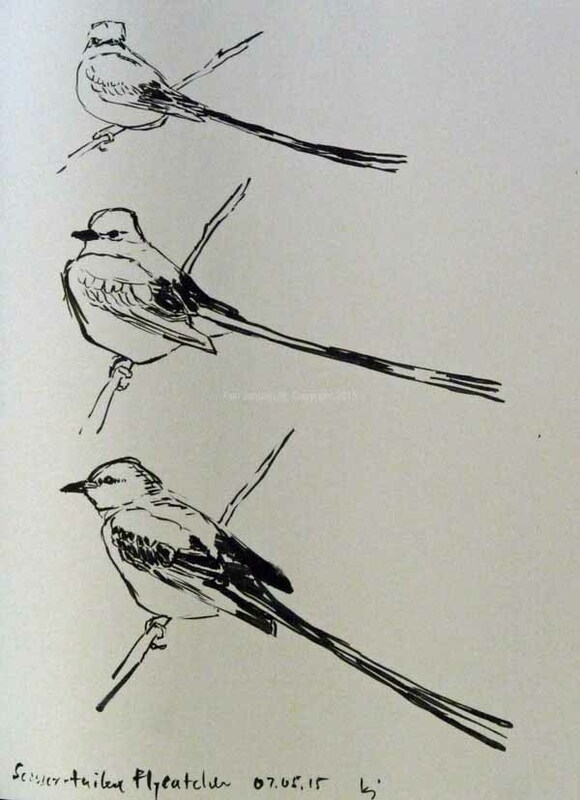 So today I went through the sketchbooks for the last 6-7 years, back to my very first incredibly feeble attempts at drawing birds from life, and scanned a number of them into the computer. Two of the most recent are below. In the first I added watercolor to the pencil sketches after I got back home. In the second I added wash using Caran d'Ache Neo-color II water soluble crayons in the field to the Black-crowned Night Heron and Yellow-breasted Chat. Though there is still a lot of room for improvement I think you can see some improvement compared to the earlier sketches below them. 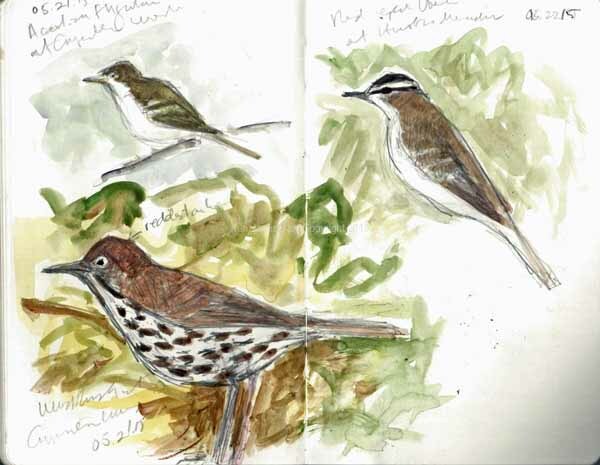 Wood Thrush, Acadian Flycatcher, Red-eyed Vireo. 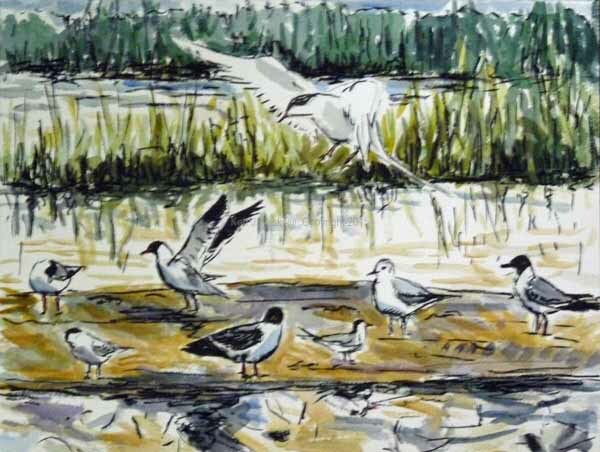 Field Sketch by Ken Januski with watercolor added later. Black-crowned Night Heron and Yellow-breasted Chat. Field Sketch with Neo-color II Crayon wash by Ken Januski. All in all I'm glad that I've pursued sketching birds from life. 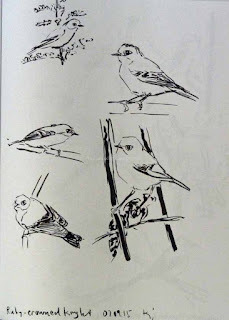 There is just one primary source for that: Drawing Birds by John Busby who just recently passed away. 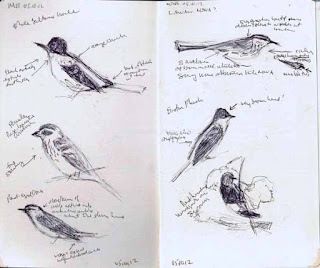 It was that book, later complemented by the artists who then frequented the Wildlife Art thread of Birdforum that convinced me that working from life was the primary method of making wildlife art alive. Even more it convinced me that wildlife art could be ART. 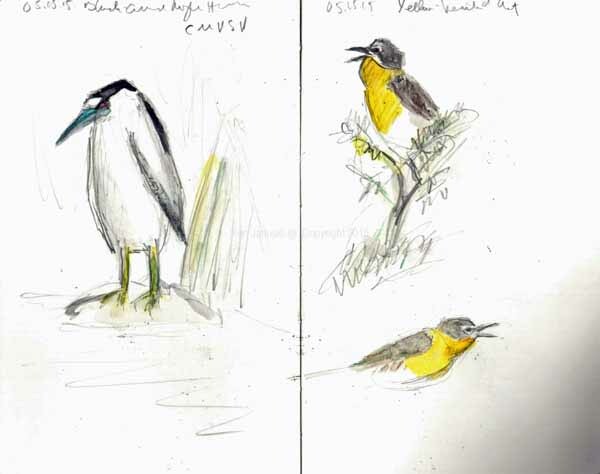 Green Heron, Belted Kingfisher, Cedar Waxwing... Field Sketch by Ken Januski. 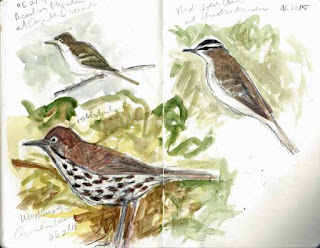 Baltimore Oriole, Rose-breasted Grosbeak, Red-headed Woodpecker... Field Sketch by Ken Januski. There are some artists who can do field studies that are far more realistic and accurate than most wildlife artists can do spending hours in their studio. But I'm not one of them. Neither was John Busby as far as I can tell. .He was more interested in capturing the life of birds. In doing so he also turned them into art. So my field sketches never look at all finished. But that's really unimportant. To me they are generally exciting. And eventually, after all that perseverance, they tend to inspire me to more finished work. Thank you Mr. Rimsky-Korsakov! Canada Geese, Common Grackle... Field Sketch by Ken Januski. 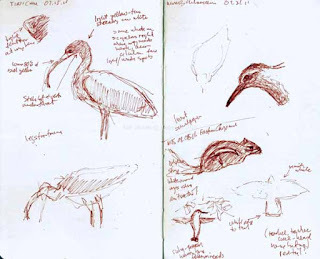 White Ibis, Ruby-throated Hummingbird, Chipmunk... Field Sketch by Ken Januski.